Deterring geese with sound can be very effective. Like all other birds, geese hear the same as humans, so don’t waste money on an ultra-sonic sound device. The best bird sound deterrent is the solar bird chase super sonic – a sound deterrent that scares birds away by playing predator and distress calls. The Solar Bird Chase Super Sonic is a programmable sound deterrent used to deter birds from large open spaces. The Solar Bird Chase Super Sonic features actual distress and predator calls of over 22 types of birds. These sounds are played every ten minutes to alert birds of danger. When birds hear these calls, their natural instinct is to flee the area. The unit is weather resistant and is solar so that it can play during clouded days. It is powered by solar energy and has a light sensor that causes the unit to shut off at night to conserve energy. The unit is easy to install where ever birds are a problem. Having geese around can be harmful since they leave behind potentially contaminating droppings and can be aggressive at times. If you take away the direct food source for geese they have no reason to hang around your property. Poisoning geese or other lethal methods to get rid of geese is never an option, however. Instead, use a humane liquid deterrent to remove their food source. Migrate Goose Repellent is a non-toxic liquid goose repellent used to make grass areas unpalatable to geese. The goose deterrent is made of grape extract that irritates the bird’s trigeminal nerves and mucous membranes causing an uncomfortable sensation in their mouth, nose and eyes when they eat the treated grass or shrubs. The liquid deterrent is completely humane and safe for humans and pets as well. It simply causes the geese to move on to more appetizing grass. Swallows can be a nightmare for homeowners. They are very territorial, returning to the same nesting site in the spring and summer. While homeowners should be concerned about swallows nesting on their homes, keep in mind that there are limitations to what one can do to get rid of these pest birds. Since swallows and their nests are fully protected under the Migratory Bird Treaty Act of 1918, it is illegal to intentionally kill, injure or take the swallows. It is also illegal to intentionally damage or destroy the nest, eggs, or young of a swallow while it is being built or in use. The Act allows fines or prison sentences for every bird, egg or nest destroyed. Ideally it is best to deter birds before they begin nesting; however, if swallows have nested in a particular location in the past they will be back. Using a physical deterrent, like bird netting, is the best way to ensure swallows do not rebuild their nests on your property. An effective type of bird netting one can rely on to safely exclude swallows is Ultra Net. This low-profile plastic bird netting is an ideal way to prevent birds from getting under eaves, barns, balconies, garages, sheds and other areas around your home. The netting is a lightweight plastic mesh made of durable, U.V. protected polypropylene. It comes in three different mesh sizes: 3/4”, 1/2”, and 1/4” and a variety of cuts to match the area being treated. Ultra Netting is easy to work with and can be readily secured with twine, zip ties, or hog rings. 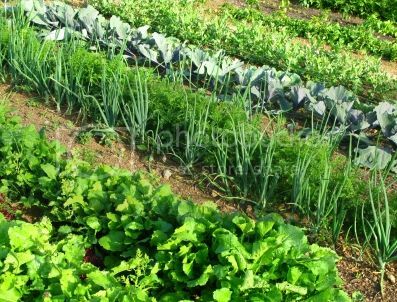 For vegetable gardens, wrap individual plants or suspend netting around the entire garden area for protection. Ultra netting is meant for temporary use and hangs easily using the clips provided by the manufacturer. You can also just use a staple gun to secure the netting around any perimeter. The Solar Bird Chase Super Sonic is a programmable bird sound deterrent used to deter birds from large open spaces. The unit is weather resistant and is solar so that it can play during clouded days. Easily install the Solar Super Sonic where ever birds are a problem. Birds are often a problem in large open spaces, like yards, gardens, small orchards or vineyards and rooftops. Bird sound deterrents can be a very effective bird control solution by scaring the birds away from open areas. An excellent sound deterrent is the Solar Bird Chase Super Sonic, a programmable sound deterrent used to deter birds from large open spaces. The unit is weather resistant and is solar powered for energy conservation and convenience in areas without electrical outlets. It can be installed where ever birds are a problem. During the day the device operates off of solar energy and a light sensor shuts the device off at night to conserve energy. Birds hear on the same level of humans and do not hear ultrasonic noises; therefore the device has volume control and operates between 65-105 decibels. The Solar Bird Chase Super Sonic features actual distress and predator calls of over 22 types of birds. These sounds are played for a period of two minutes every ten minutes to alert birds of danger. When birds hear these calls, their natural instinct is to flee the area. 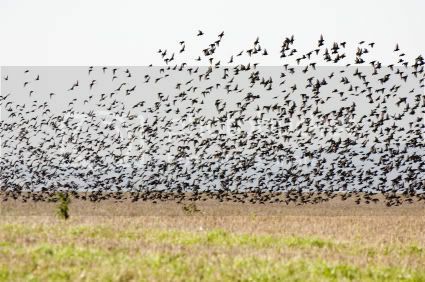 Without professional-grade bird control, getting rid of geese can be a challenge. Use a water hose or noise maker and they’ll return as soon as you leave. Pellet guns and poisons are not only inhumane but only temporarily effective. In some cases, these drastic measures may even be illegal, resulting in costly fines. If geese are grazing on your lawn, use a tried and true, humane goose control solution to get rid of these pest birds – Migrate Goose Repellent. Migrate Goose Repellent is a non-toxic liquid goose repellent used to make grass areas unpalatable to geese. The liquid repellent is non toxic and safe to use around people and pets. The active ingredient in Migrate Goose Repellent is non-toxic grape extract, Methyl Anthranilate. The extract irritates birds’ trigeminal nerves and mucous membranes, they do not like the sensation caused by the extract and will avoid the area being treated. 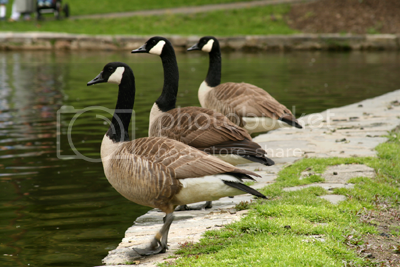 Migrate Goose Repellent is applied to grass or shrub areas where geese have been grazing. When Geese go to graze on the treated areas, they will realize there is no longer a food source, and move on. One gallon of Migrate Goose Repellent will cover approximately 16,000 square feet for one application. Migrate lasts 3 months outdoors, and won’t wash off with rain or water. It is safe to use around people and pets. It works well on lawns, shrubs, gardens, shorelines, parks, golf courses, greenbelts, cemetaries and other grassy areas. To apply, simply mix one part concentrate with 12 parts water. Before application, it’s important to first to mow the lawn area you wish to treat. Migrate Goose Repellent can be applied with any simple hand held sprayer, commonly found at hardware stores. After the first application, you will want to reapply in four days. For best results, follow the instructions on the bottle. There are several humane bird control solutions to get rid of geese. Since geese graze on grass, especially in areas near water, you can remove their food source as a way of deterring them. Migrate Goose Repellant is a non-toxic, food grade liquid product that is used to deter geese from common grazing areas, like lawns and shrubs. Migrant Goose Repellant is made from a non-toxic grape extract that when ingested causes an irritation to the mucous membranes and trigeminal nerves resulting in the geese avoiding the treated area. Disrupting their habitat by removing any reeds will also discourage geese from nesting on your property. Scare tactics such as sound bird deterrents are also effective in goose control. Sonic Shield is a motion activated device that replicates a vicious dog barking sound when triggered. The sensor reaches a distance of about 30 feet to the front and 20 feet side to side. This is an inexpensive solution to bird control. The Goose-B-Gone Super Sonic another sound bird deterrent. It is more costly than the Sonic Shield but reaches a much greater distance and is very effective. It plays goose distress calls and predator sounds to scare geese away from your yard (or any area within a one acre radius). 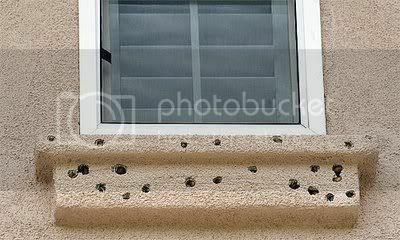 One solution to keep birds off your rooftop is to install bird spikes along the peak of your roof and along the ledges. Bird spikes are a physical bird deterrent that keeps birds from landing because of the uneven surface created by the spikes. Bird spikes are safe and humane; they will not harm birds. The spikes come in different widths to ensure they cover the width of your roof ledges. Bird spikes are also available in stainless steel or plastic. They are very easy to install with either adhesive or screws and come with industry leading guarantees. Spikes work on larger birds like pigeons and seagulls. For birds perching on the slope of a roof or on flat portions where it may not be feasible to install multiple rows of bird spike, the Bird Spider 360°™ is a great solution. The Bird Spider 360° is designed to spin in the wind while its stainless steel arms bounce around. This commotion causes a confusing visual distraction that scares birds away from the area. The Bird Spider 360° works on larger birds like pigeons, seagulls and crows. It comes in multiple sizes (2’, 4’, 6’ and 8’) to cover different diameters. The Bird Spider 360° is easy to install with screws or adhesive and has several additional mounting options. Keep birds off your rooftop with bird control solutions! The Repeller 360° spins in the wind to prevent large birds such as gulls, pigeons and crows from landing in unwanted areas. The unit offers pest bird protection in a 6-foot diameter, keeping birds from perching and loitering. The Repeller 360° features two “sails” mounted at the end of each stainless steel arm. 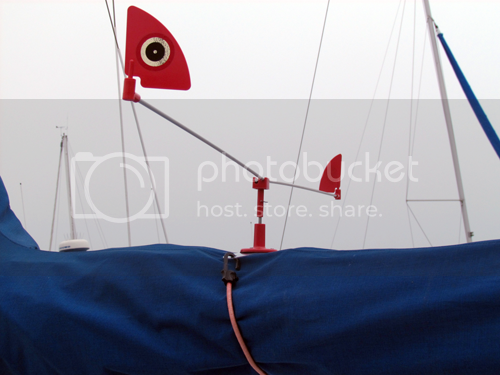 Each sail displays a reflective bird predator eye. When the wind spins the Repeller’s arms, they intimidate and frighten pest birds daring to land near them. The wind-powered arms rotate continuously in the slightest breeze. Because the Repeller 360° uses sustainable wind energy, it can be placed virtually anywhere pest birds gather, perch or roost. No electrical cords or connections are required. The unit is easy to set up using a patent pending clip that locks it into place. The unit’s railing mount is easily attached to railings from 1- to 5-inches thick to keep pest birds from ruining boat railings. All that’s required is to tighten the screw until the unit is secure. The unit has been specially designed not to blow off in high winds. Engineered for outdoor use, the Repeller 360° uses UV-protected materials, including polycarbonate fins and a rugged base supported by two stainless steel rods. This ensures lasting performance in punishing outdoor weather. Woodpeckers can cause serious damage to homes and property, resulting in unnecessary repair costs. Sometimes visual deterrents will be enough to keep the woodpeckers away but if they are relentless then more drastic measures may be necessary. The surest way to prevent woodpeckers from destroying your property is to net them off. Woodpecker netting is made of a lightweight plastic mesh and can be installed on the side of a structure to block woodpeckers from pecking. Woodpecker netting acts as a physical barrier to block woodpeckers from gaining access to wood or stucco siding. The birds will be discouraged by the barrier and move on. It is great on eaves, siding and canopies. 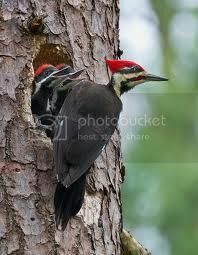 Don’t be left with woodpecker house damage! Get rid of woodpeckers! If you need assistance installing the woodpecker netting, there are authorized installers in your area that will be happy to help. During autumn months woodpeckers begin storing their food to have plenty to eat during the winter. Use a Woodpecker Deterrent Kit to keep them from ruining the aesthetics of your home or property. They drill holes in wood structures looking for food, storing food or as a mating call. The repairs can be rather expensive so it’s best to deter them before they come or as soon as the issue begins. The Woodpecker Kit will help get rid of woodpeckers. It is the ultimate woodpecker deterrent; it comes with a bright yellow balloon with a predator eye, flash tape and installation brackets for hanging the deterrents. Installation is extremely easy; hang the balloon from the bracket included in the kit and cut the flash tape to the desired lengths and tie it around or hang it from poles, trees, or other objects in the target area. The bird deterrents in the woodpecker kit are not harmful to birds; they simply give the presence of danger in the area and the movement and bright colors cause confusion to keeps birds away. As you prepare to put your boat away for winter, remember that birds cause damage to boats even during the off season, costing boat owners a fortune in cleanup and repairs. 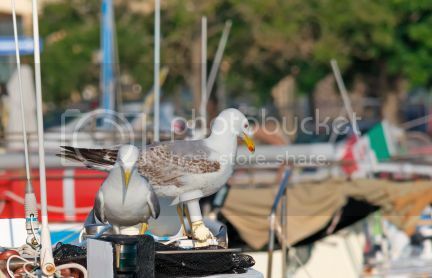 Birds make themselves right at home on boats while you are away. They leave behind smelly scraps and bird feces, which can not only stain boat coverings but it contains acids that can damage certain boat materials as well. Avoid the mess and unnecessary financial headache of having birds land and nest on your boat with humane bird deterrents. The Repeller 360° spins in the wind to prevent large birds such as gulls, pigeons and crows from landing in unwanted areas. The unit has a six inch diameter and is ideal for boats and docks. The Repeller 360° is made of stainless steel arms attached to a UV protected polycarbonate base. At the end of each “arm” attached to the top of the Repeller is a reflective “predator eye”. The spinning motion and reflective predator eye will work to scare birds and prevent them from landing in treated areas. Visual deterrents are ideal for large and small birds. Visual bird deterrents can be placed in various areas around the boat, dock or boat house to scare birds away from the area. A scare eye balloon and red flash tape are great options to keep birds away. These products can be used alone or in combination with other products. When birds are a problem in large open spaces, like yards, gardens, small orchards or vineyards and rooftops, bird sound deterrents can be very effective in scaring the birds away. An excellent sound deterrent is the Solar Bird Chase Super Sonic, a programmable sound deterrent used to deter birds from large open spaces. The unit is weather resistant and is solar powered for energy conservation and convenience in areas without electrical outlets. It can be installed where ever birds are a problem. During the day the device operates off of solar energy and works on rechargeable batteries at night. Since birds hear on the same level of humans and do not hear ultrasonic noises, the device has volume control and operates between 65-105 decibels. The Solar Bird Chase Super Sonic features distress and predator calls of over 22 types of birds. These sounds are played for a period of two minutes every ten minutes to alert birds of danger. When birds hear these calls, their natural instinct is to flee the area. Keep birds away from open spaces with the Solar Bird Chase Super Sonic! 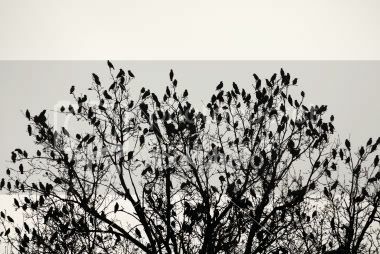 Birds gather in trees, creating a lot of loud noise and an unsightly mess. If you have a flock of birds roosting in trees on your property, the best method of deterring the birds is by using scare tactics. 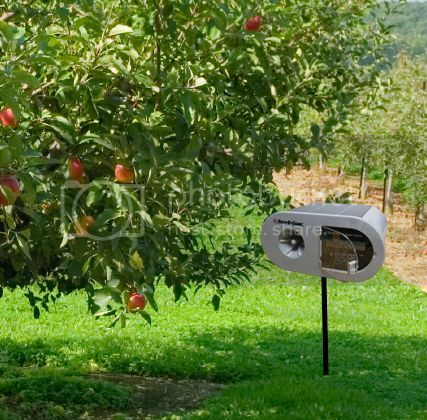 The Bird Chase Super Sonic is a programmable sound deterrent used to keep birds out of large open spaces. Birds hear on the same level of humans and do not hear ultrasonic noises. The Bird Chase Super Sonic features actual distress and predator calls of over 22 types of birds. These sounds are played for a period of two minutes every ten minutes to alert birds of danger. When birds hear these calls, their natural instinct is to flee the area. The unit is designed for outdoor use and is weather resistant. It comes with one internal speaker that will cover one acre with the volume at full capacity. Four additional external speakers can be purchased to cover a larger area. Installation is easy; you simply attach the power supply cord to the back of the unit, and plug it in to a regular 110v outlet. An LCD screen displays how the unit is programmed. You can program the Bird Chase Sonic for a specific bird, or set it to the general setting. A solar option is now available. The unit operates the same as the electric version; however, it is powered with solar energy. Scare birds away with sound bird deterrents. If you have a problem with pigeons or larger birds landing and roosting on your home, plastic bird spikes is the solution for you. Visit Absolute Bird Control today to learn more! Bird Netting is used to prevent birds from accessing unwanted areas such as gardens, eaves, canopies, and more. The netting acts as a physical barrier to humanely prevent birds from reaching the desired location. Bird Netting is the most effective way to prevent birds from nesting. Nesting birds can be quite territorial and are known to relentlessly protect and return to an established nesting site. Garden bird netting will eliminate protected garden areas from the potential of nesting birds. The garden bird netting is made of U.V. protected polypropylene. The plastic netting is designed to keep pest birds from eating your crops and destroying your vegetation. It comes in a variety of mesh sizes: ¾”, ½” and ¼”. It also comes in several cut sizes to fit different size garden or treatment areas. Keep birds out of the garden with garden bird netting! 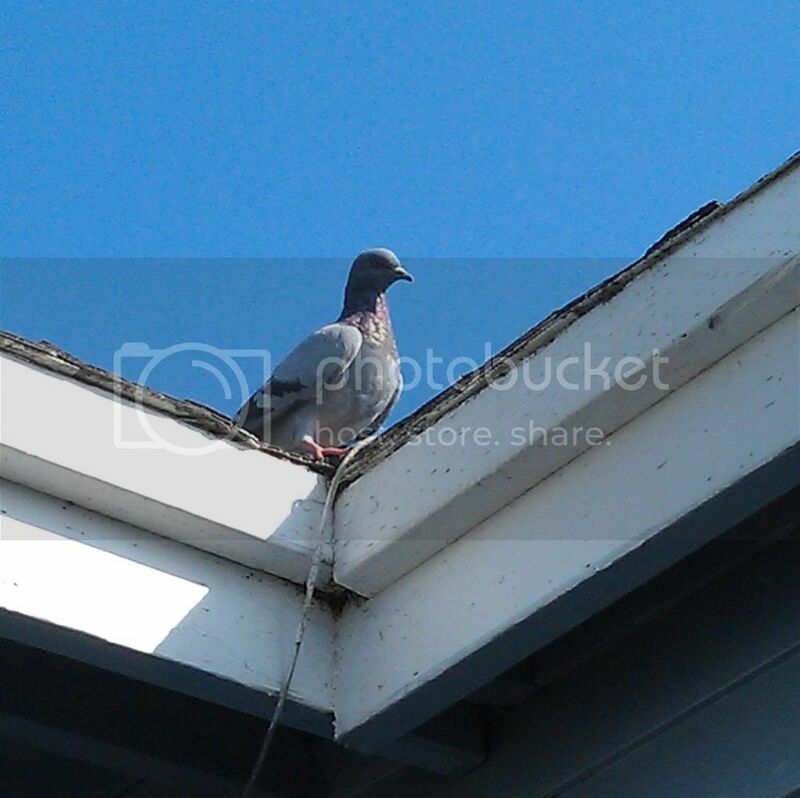 Homeowners often have issues with large birds landing on the edge of their roof, windowsills, under eaves and other flat or curved surfaces on their property. Birds landing and roosting are also pooping. Bird droppings create an unsanitary and unsightly mess for homeowners. To deter larger birds, like pigeons, crows and seagulls, from landing and roosting on your property, install polycarbonate bird spikes. Plastic bird spikes work as a physical bird deterrent creating an uneven surface that birds cannot land on. The spikes are available in different spike widths: 3”, 5” and 7” to cover different ledge and surface widths. Choose from seven colors: clear, white, tan, grey, brown, black and brick red. The bird spikes are made of a U.V. protected polycarbonate plastic. Since the spikes come pre-assembled in two foot strips with pre-drilled holes along the base, installation is fast and easy – cutting time to install in half. Plastic spikes can be glued or screwed to most surfaces. Keep birds from landing on your house with plastic bird spikes! This lightweight netting is made of U.V. protected polypropylene. The plastic netting is designed to keep pest birds from eating your crops and destroying your vegetation by creating a physical barrier to humanely block birds from unwanted areas. It comes in a variety of mesh sizes: ¾”, ½” and ¼”. It also comes in several cut sizes to fit different size garden or treatment areas. When the birds realize they cannot access the blueberry bushes, they will move to a more fruitful area. Once the birds are gone you can remove the netting. Garden bird netting can be used for other fruit and berries as well. Keep your harvest plentiful this year! 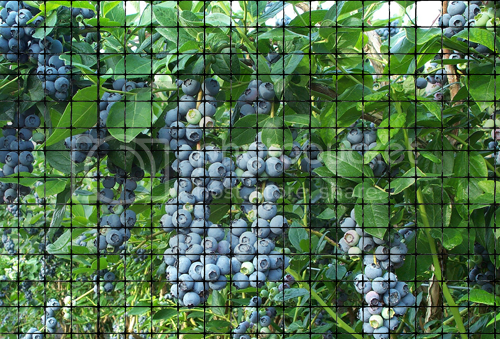 Deter birds from your blueberries with garden bird netting! Canada Geese loiter on your property over-grazing and pooping, killing your grass and leaving behind a mess. There are several ways to keep unwelcome geese off your property but one the best methods is Migrate Goose Repellent. This goose repellent takes away their food source without harming them. Made of grape extracts that irritate the birds trigeminal nerve and mucous membranes, Migrate Goose Repellent produces an uncomfortable sensation causing them to move on to a more appetizing food source. Migrate Goose Repellent comes in a one gallon jug and can be applied directly to the grass area and shrubs that needs to be treated. Treatment is easy! Simply mix one part goose repellent concentrate with 12 parts water and spray the area using a hand held sprayer. Soon you will get rid of geese! 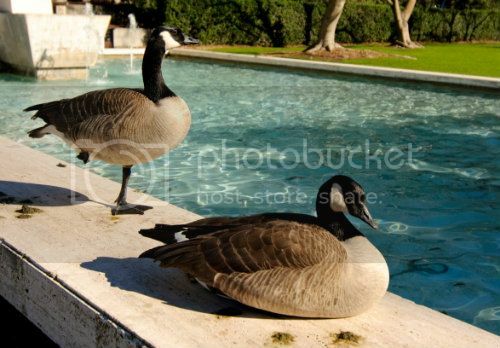 Deter geese from grazing on and destroying your property! Are birds destroying your garden? Whether you have a lush green oasis full of flowers, a fruit and vegetable garden or a small berry orchard, chances are you want to preserve it and keep pest birds away. While some birds are beautiful to watch and listen to, when they are in your garden birds can be destructive by eating your crops and pooping everywhere. Not only do bird droppings pose many health hazards but it is also an eyesore to have bird poop covering your garden. There are several humane bird control solutions for ridding your garden of pest birds. Visual bird deterrents can be placed in and around your garden area to scare birds away. The Red Tail Hawk decoy, for example, is a natural predator for large and small birds and is very effective in deterring birds. 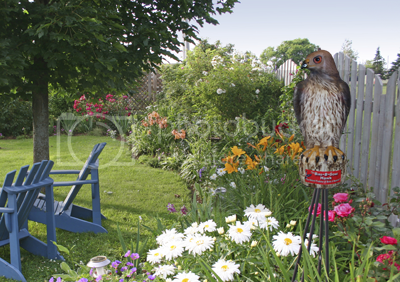 Place the hawk decoy on a fence or roof to scare birds away. Flash tape is red reflective tape used to hang in trees, plants and gazebo-like areas. When the flash tape blows in the wind it creates an unfamiliar and disturbing distraction that bird stay away from. Other visual deterrents include diverters and balloons that also hang in trees and bushes and resemble the eye of a predator causing birds to steer clear of the area. Most visual bird deterrents are very cost effective solutions to keeping your garden bird-free. 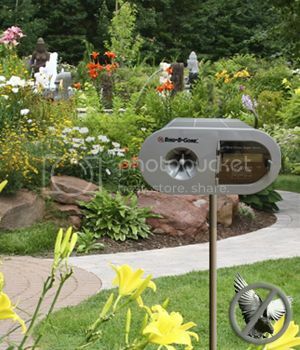 Sound bird deterrents are also very effective for scaring birds away from your garden. The Bird Chase Super Sonic, available in a solar and electronic version, is an excellent option for keeping birds out of your garden. It plays predator calls and distress signals for several species of birds causing pest birds flee the danger zone. The Bird Chase Super Sonic covers an acre making it perfect for gardens and yards. For smaller areas, like balconies with planter boxes, the Sonic Shield is great. When triggered, this motion activated device replicates a vicious barking dog, causing birds to quickly flee the area. Get your bird control products today and start enjoying your garden! Get rid of the birds! 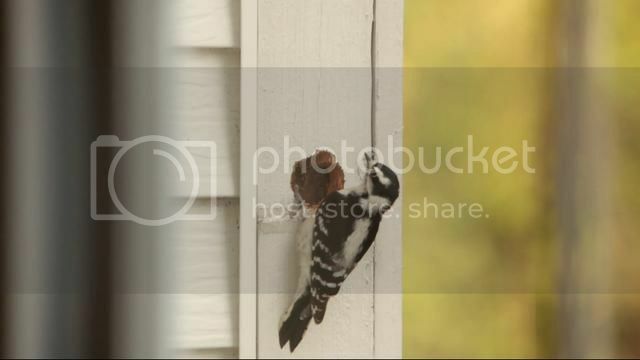 Are woodpeckers causing damage to your house? We typically think of woodpeckers as beautiful, vibrant birds that have an amazing ability of tapping their long beaks a million miles a minute; however, the truth is that woodpeckers are a nuisance to many home owners. Typically they are found in forests and wooded areas, but they are no stranger to residential areas, where they will peck on homes, telephone poles or anything wooden where they might find food. When woodpeckers target your house or property, they will drill relentlessly either in search of food or as a mating call to attract a mate. Woodpecker house damage is unsightly and is an unnecessary expense that can be avoided altogether. There are several humane ways to get rid of woodpeckers. One of the easiest and most inexpensive ways to deter woodpeckers is with the Woodpecker Deterrent Kit, which is the ultimate woodpecker control solution that comes with a repeller balloon, flash tape and installation brackets for hanging both. Installation is extremely easy and because this is a visual deterrent, there are no chemicals or anything harmful to birds. It simply scares the woodpeckers away because they see the balloon as a predator and the flash tape is a bright moving object that causes confusion and keeps the birds away. If you prefer something a little less obvious, woodpecker netting is an excellent solution to deter woodpeckers. Bird netting takes a little more finesse to install than the visual deterrents but it is well worth the effort, causing a physical barrier between woodpeckers and your property. Once you get rid of the woodpeckers, the netting can always be removed and reinstalled next year if/when needed. R755 theme designed by varometro. 51 queries in 0.867 seconds.